Thus begins a line in a popular Christmas carol. It’s something parishioners at Christ the King Parish in Topeka do daily. That’s because for 25 years, more than 400 current, former and deceased parishioners have participated in perpetual eucharistic adoration, thus adoring Christ just like the three wise men who traveled for miles to be among the first to adore the Christ Child. At the end of the 7:30 a.m. Mass on Jan. 6, the solemnity of the Epiphany, Father Matthew Schiffelbein, the parish’s pastor, honored all those involved in the adoration ministry. After a standing ovation for the Wiecherts, Father Schiffelbein invited anyone else involved in eucharistic adoration to stand and be recognized for their commitment. 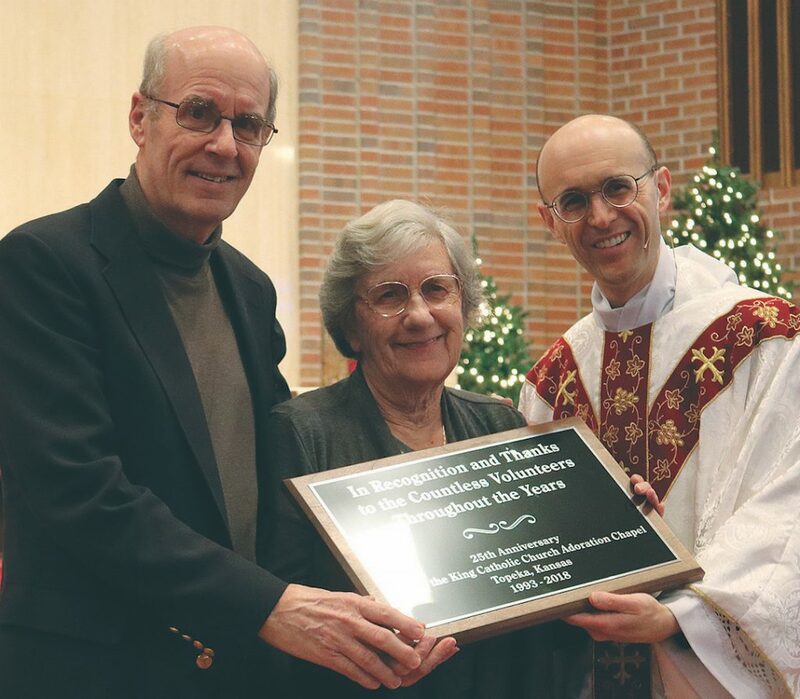 Besides the Wiecherts, an additional 90 parishioners started in the ministry 25 years ago. Many of them maintain the same hour. For example, Liz Bessette has an hour at 5 a.m. Wednesdays, a time she cherishes. “It’s so peaceful,” she said. Like Bessette, Fred Biesemeyer has an early morning hour — actually two, from 2 to 4 a.m.
“Of course, I have the good hours,” Biesemeyer said, adding those early morning hours are quiet, peaceful and without interruption. It’s not something he planned on doing 25 years ago, but a parishioner invited him. “It was just the right time in my formation,” he said. The blessings he’s received from spending time with Jesus have just magnified in his life, and he feels spiritually renewed every time. “It starts my day off right,” he said. For Jane Proctor, another parishioner with an hour at 5 a.m., the time has brought her closer to God in a way she is not able to do at home. There’s something to be said for praying with the real presence of Christ, she said.